Winter means ducks and their allies bobbing and diving offshore. The little blubber-bombs shrug off the cold, cold water. 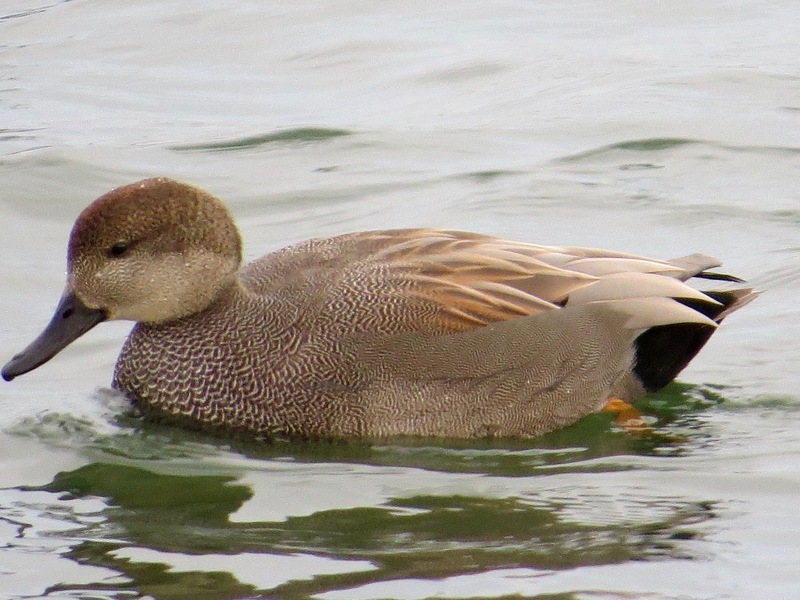 A recent trip to wind-ripped Bush Terminal Park revealed Brant, Mallard, American Black Duck, American Wigeon, Red-breasted Merganser, Bufflehead, Red-throated Loon, and Gadwall in the bays. You need to get a close view of the latter, Anas strepera, to really appreciate the astonishing beauty of the drakes. From afar, the plumage is rather subdued. Up close, or through the magic of optics, the fine and subtle details! In flight, Gadwall show their white secondaries to advantage. They usually display a patch of them (the speculum) when not flying. But this drake is having none of that. Gorgeous drake. Females are known as? Or sometimes “ducks” as in “ducks and drakes,” which is also a game in the UK which we in the US call skipping stones.